Scarce wall map of Rhode Island showing landholders. Map of the State of Rhode Island and Providence Plantations. 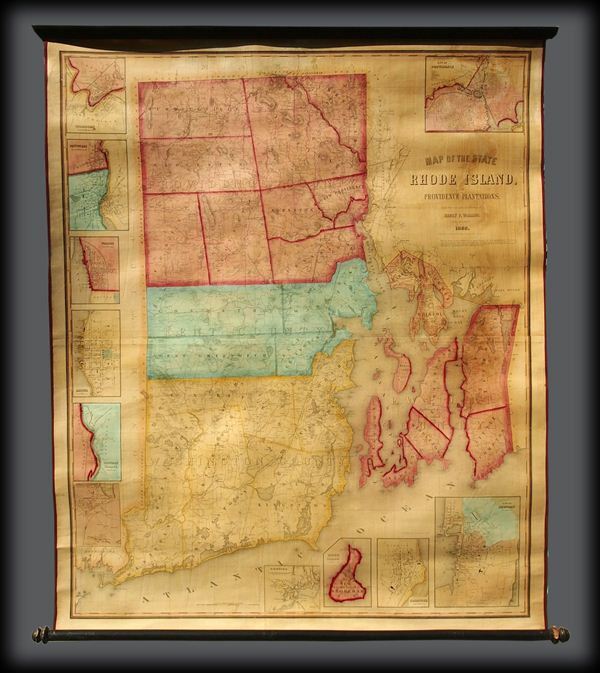 A remarkable rarely seen 1855 wall map of Rhode Island by the Civil engineer Henry F. Walling. Centered on Narragansett Bay, the map covers the entire state and offers no less than eleven detailed insets of various cities. Walling identifies countless individual estates and homesteads throughout - making this a treasure for anyone researching family history or the mid-19th Rhode Island land holdings. Roads, counties, topography, railroads, lakes, and rivers are noted. Narragansett Bay features numerous depth soundings no doubt drawn from the work of the U.S. Coast Survey. The insets, from top left detail Woonsocket, Pawtucket, Warren, Bristol, Westerly Village, Smithville (Scituate), Wickford, Block Island, Greenwich, Newport, and of course Providence. In the Providence inset the campus of Brown University is identified. In his long career as a cartographer Walling produced only three state maps, this one of Rhode Island, Vermont, and Maine. The present example is the first, 1855, edition of this plan. It was subsequently reissued in the 1860s on an even larger scale. All examples are extremely scarce and rarely appear on the market. Very good. Professionally cleaned and re-backed on fresh linen. Chapin, H. M., Check List of Maps of Rhode Island, no. 77.